In the age of Internet and emails, writing by hand maintains an aura of elegance and of a delicate treasure, a gift that only a select few possess. For anyone who appreciates hand-made products, the sound of a nib sliding on paper is a tremendous source of pleasure. For those who refuse to follow the flock, pens act as a counterweight to the computer age. And I must confess, I identify myself with this group, not only for my appreciation and admiration for the calligraphers, but also for my fascination with writing instruments - and the ever graceful fountain pen. 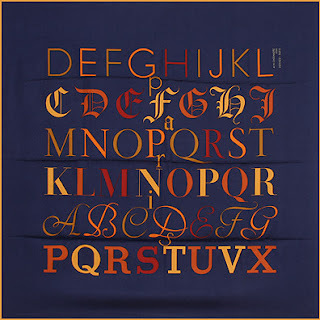 The scarf depicts an alphabetical sequence of letters in various fonts, reminding of the gift of reading and writing that we so often take for granted. Like a novel where the stories lie hidden in the rows of letters, words, paragraphs, pages and chapters, this scarf reveals a story as well, and even features words between the lines - literally: not only the more obvious "PARIS" spelled in between the lines, but also "HERMES" - one letter at a time, found in each of the six rows of letters. Looking at this scarf, I found my mind carrying me to a story shared by Steve Jobs, the founder of the latest world-wide sensation, the iPad. In an address to the college graduates, he shared not only his passion for nice fonts that he studied in college himself, but how his interest, at a time when he didn't know what his purpose in life was, became so relevant when he embarked on developing a new computer and, as part of it, nicer fonts. I found his story particularly relevant because I, too, found myself drawing on the general knowledge I cultivated during my high school and university years. Deceptively simple, this design is remarkable for the elegance it infuses into the scarf when knotted.